How to watch Timmy Time: Timmy's Christmas Surprise (2011) on Netflix Canada! Sorry, Timmy Time: Timmy's Christmas Surprise is not available on Canadian Netflix, but you can unlock it right now in Canada and start watching! With a few simple steps you can change your Netflix region to a country like Argentina and start watching Argentine Netflix, which includes Timmy Time: Timmy's Christmas Surprise. We'll keep checking Netflix Canada for Timmy Time: Timmy's Christmas Surprise, and this page will be updated with any changes. 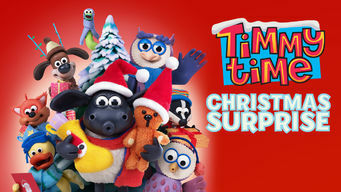 Timmy Time: Timmy's Christmas Surprise is not available in Canada BUT it can be unlocked and viewed! When Timmy and his friends get snowed in at the nursery on Christmas Eve, Osbourne and Harriet make the best of it by creating a yuletide atmosphere. A Christmas blizzard isn't terrible at all. Ask these cuddly critters. It's a winter wonderland and the best gift ever! There is a way to watch Timmy Time: Timmy's Christmas Surprise in Canada, even though it isn't currently available on Netflix locally. What you need is a system that lets you change your Netflix country. With a few simple steps you can be watching Timmy Time: Timmy's Christmas Surprise and thousands of other titles! Watch "Timmy Time: Timmy's Christmas Surprise"